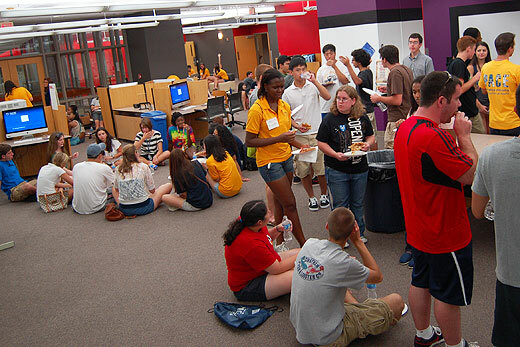 A pizza party and tours of the library will take place Aug. 27 from noon to 2 p.m., after the campus orientation. The Robert W. Woodruff Library is welcoming Emory’s 1,300 new students with three fun and helpful activities that will familiarize them with the resources and services they’ll come to rely on during their Emory years. "It’s a great time of year, with all the activity and the new students," says Erin Mooney, the first-year class librarian. "Everyone is so excited." New students can take part in a voluntary two-week scavenger hunt that runs Aug. 25 through Sept. 8 in the Woodruff Library. Participants can pick up or access online a list of 10 items to find and photograph within the library (including taking a picture of something that confuses them), then show their results to the reference librarian (the "judge") working at the Library Service Desk. When their results are approved, students can pick up freebies and become eligible for the raffle prize. "This will get them into various areas of the library in a fun way," Mooney says. A pizza party and tours of the library will take place Aug. 27 from noon to 2 p.m., after the campus orientation. The pizza party will be held on the third floor, in the Jones Room and in the large study space across from the Research Commons. "Last year was a huge success," Mooney says. "We went through 2,176 slices of pizza. Students will be back in the library later in the semester for an assignment in the PACE (Pre-Major Advising Connections at Emory) program, required for first-year students. The research component gets students into the library so they can get hands-on experience searching for materials – and asking for help. Assignments might include finding a New York Times article that appeared on your birthday, or using an item description in a library exhibition to track down its home collection in the Manuscript, Archives, and Rare Book Library (MARBL).